I planned to visit New Orleans back in late 2005, but the city, and its good people, had been devastated by Katrina in the autumn and I ended up just driving through on the way to Baton Rouge. I was aghast at the upturned vehicles sitting against walls, people crammed into hotel rooms, billboards completed flattened, and an entire bridge completely blown away across the Ponchartrain. Grab a beer and a menu at any of the great eateries along the main drag and enjoy watching the action in the street below. I love a bit of people watching and, it’s even better somewhere as beautiful as NO. 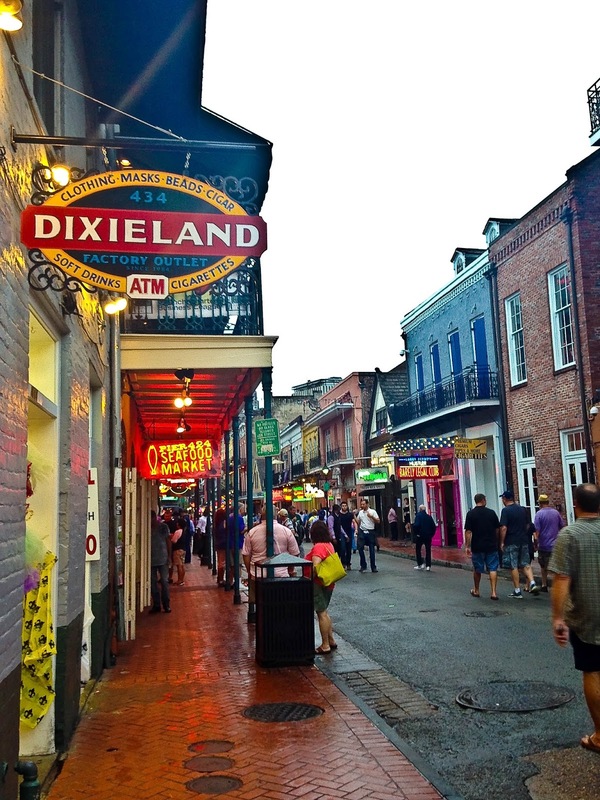 Indulge in some local crawfish or gumbo (sooo good! ), have a few drinks, and watch the street performers. 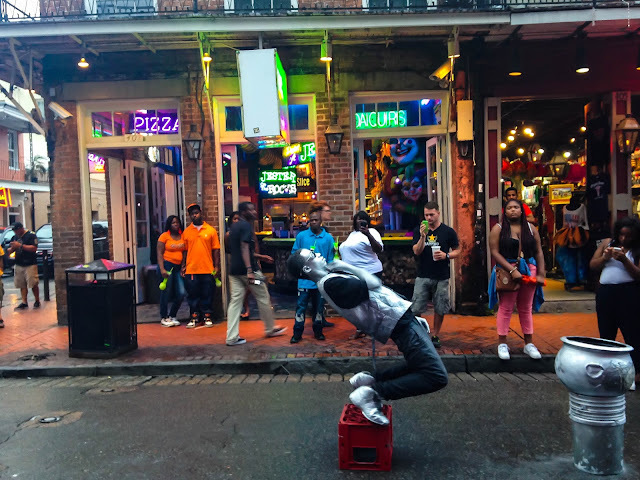 We spotted a guy flipping around like Michael Jackson, who was drawing in quite a crowd. We were also treated to some karaoke from the bar below, which was a decent rendition of a Jason Aldean song. Interestingly, we also heard a Jason fan singing the same song at a different karaoke later the same night. I had no idea he was quite so popular there. Live and learn, folks, live and learn. Ok, so there wasn’t any sport on when we visited, but if there is when you’re there: go see it! 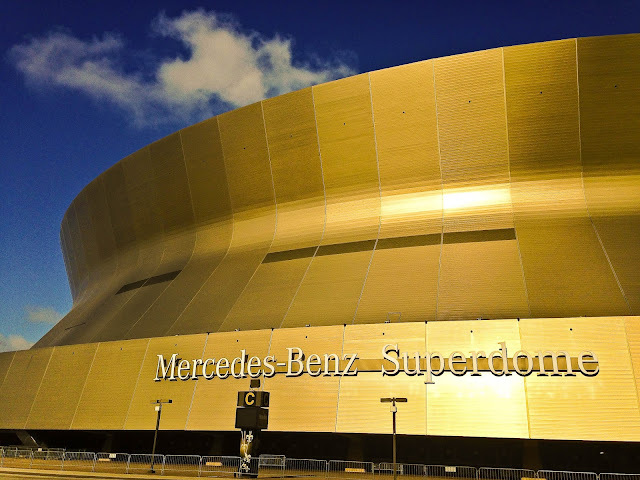 Regardless of the fact that it was shut during our visit, I really wanted to see the stadium that made so many headlines, not just for the recent success of the Saints NFL team, but also that housed and made safe so many victims of Hurricane Katrina. Outside the stadium is a 10-foot high statue of former player Tom Gleason, who famously blocked a punt against the Atlanta Falcons in 2006. However, the statue isn’t really about blocking a kick, it’s really more about showing resolve and strength in the face of adversity, as the city’s people did after Katrina. It’s beautiful, and is titled ‘Rebirth’. How apt. Located in the French Quarter, Jackson Square is a large, beautifully manicured, park, with a large statue of Andrew Jackson in the centre. Jackson was famously victorious in the Battle of New Orleans and the name was changed in his honour. Well done, Sir. 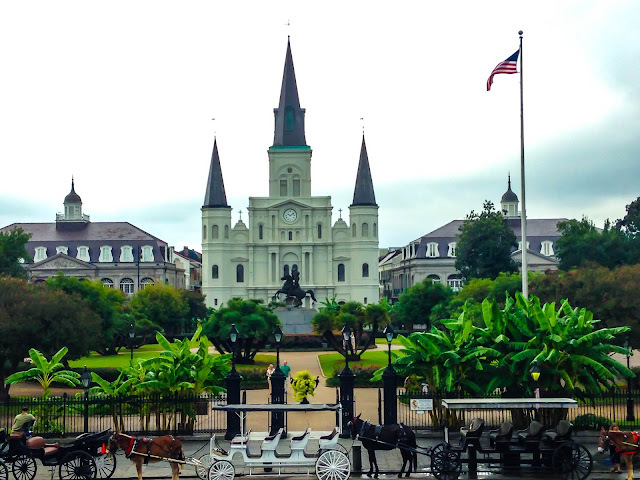 On two sides of the Square are various shops and cafes, whilst the Mississippi and St Louis Cathedral dominate the others. St Louis is one of the oldest cathedrals in the US and it looks a bit like it should be in a Disney theme park. I mean that in the sense that it’s completely magical, not plastic and ugly. No offence, Walt. The interior of St Louis is equally impressive and is free to enter. 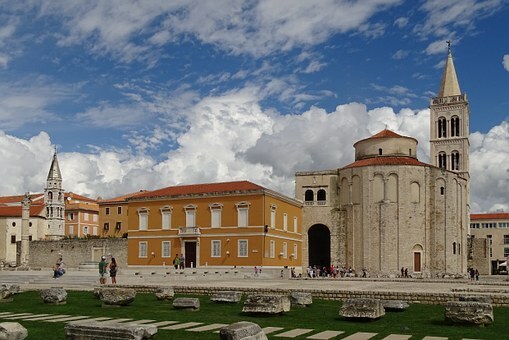 The Old Ursuline Convent Museum is next to the Cathedral and is also open to the public, for self guided tours. Thie Convent is the oldest building in the Mississippi Valley. See? It could totally be out of a Disney movie! 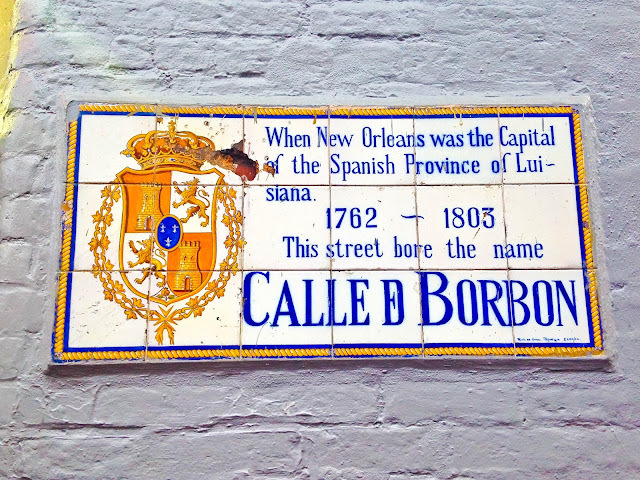 We stumbled upon Café du Monde on our way to Jackson Square to meet General Andrew, and decided we’d have coffee with Joan of Arc first, and then visit him later. That’s just how we roll. 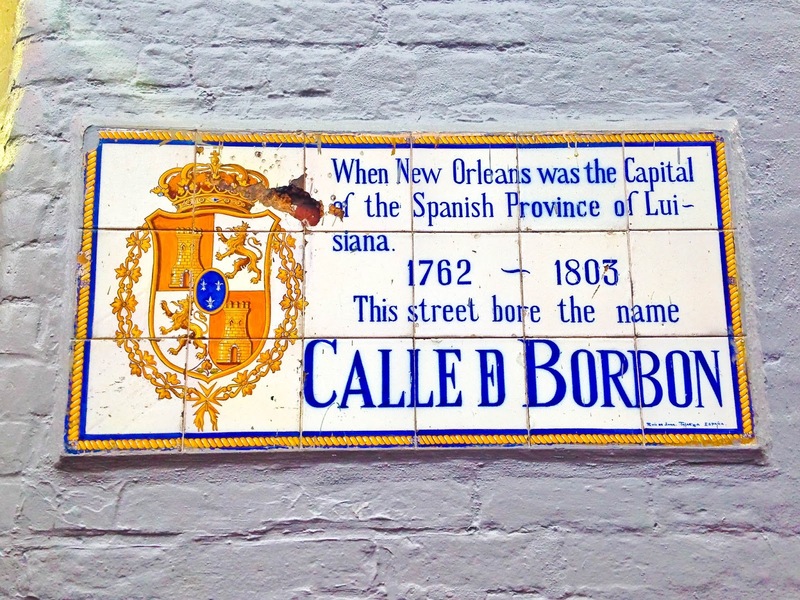 As well as being famous for its milky coffee, Café du Monde is also famous for beignets. These are a kind of deep fried choux pastry, like churros. Not being a doughnut fan, I managed to resist, but LT is never one to shy away from food. They smelled amazing, if that makes any difference at all. No? Ok, then. 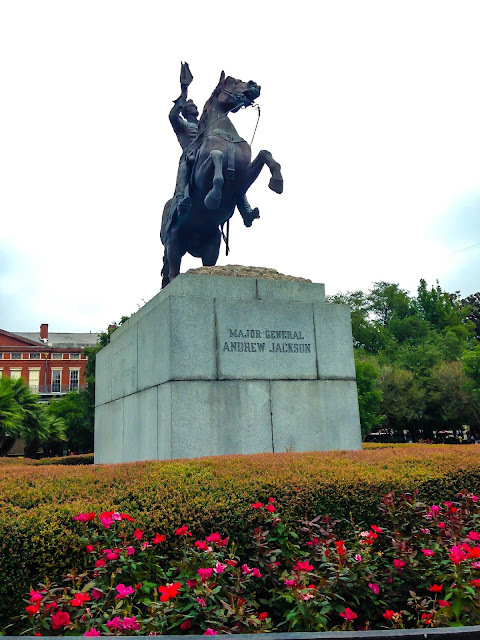 Just next to Café du Monde is a rather large statue of Joan of Arc, which was gifted to the city by France. The Maid of Orleans stands proudly at the French Market, all gold and shiny. She’s quite an impressive size and comes complete with her weapon of choice: the cannon. Actually, she comes with two, but I guess it’s like shoes…you can’t get by with just the one, can you? Exactly. She hasn’t always been located here, but I’m assuming the smell of the coffee and beignets was too much to resist. And who could blame her? 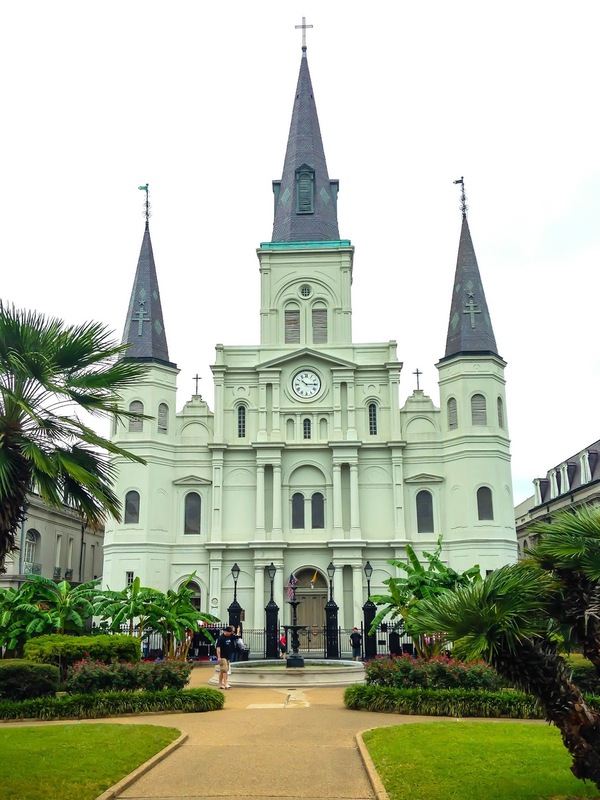 Have you visited New Orleans? What are your recommendations?